When a person is arrested for driving under the influence (DUI) in Palm Beach County, Florida, a police officer will request that person submit to a breath alcohol test in most scenarios. While a person may refuse to take a breath test, Florida’s implied consent laws provide that refusal to submit to a breath test can result in a 1 year drivers license suspension, or more, and the refusal to provide a breath sample can be used in a DUI trial as evidence of guilt. A person who is arrested for DUI in Palm Beach County will typically take a breath test at the BAT (or Breath Alcohol Testing Facility) located at the “Gun Club” Main Detention Center. Prior to administering the test, an officer will wait 20 minutes and observe the arrestee to ensure that the person does not put anything into his or her mouth, regurgitate, vomit, or belch, as these actions can influence the test result. Once the 20 minute “observation period” is over, the officer will ask the arrestee to blow into the machine (Palm Beach Sheriff’s Office currently uses the Intoxilyzer 8000) for a certain length of time and then tell the person to stop. If the test-taker does not blow hard enough into the machine, or does not provide enough air, the machine could read an error, requiring an additional attempt. If an officer believes that the person is purposefully not providing enough air in an attempt to trick the Breath Test, the officer could count that as a refusal and end the test. A breathalyzer measures the amount of alcohol in a person’s breath, and converts that into a Breath Alcohol Level, or BAL, also referred to as a Breath Alcohol Content (BAC). A .08% BAL/BAC is equal to .08 grams of alcohol per 210 liters of breath. Pursuant to Florida Statute 316.1934, there is a presumption in the State of Florida that a person who has a breath or blood alcohol content of .08 or above is under the influence of alcohol to the extent his or her normal faculties were impaired. 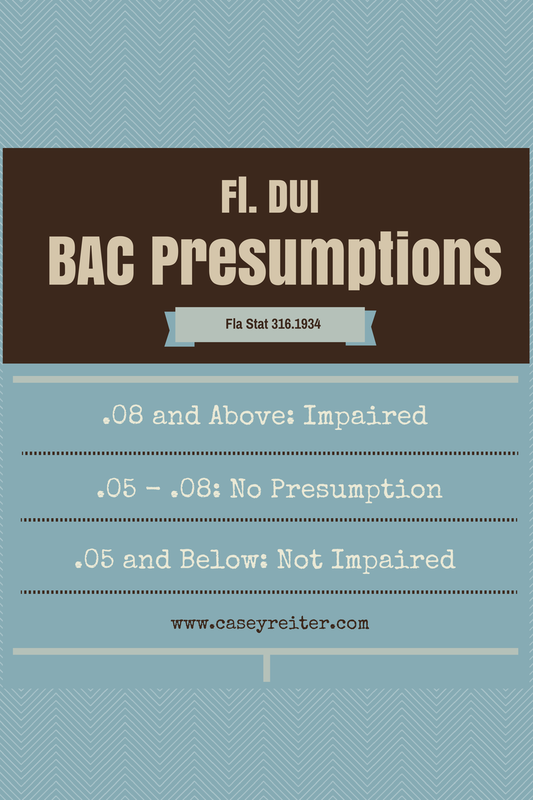 There is no presumption one way or the other for a person whose BAC is between .05 and .08. When a person has a BAC of .05 or less, it is presumed that the person was not under the influence of alcoholic beverages to the extent that his or her normal faculties were impaired. DUI cases with breath test results are commonly prosecuted in Palm Beach because they provide scientific evidence to present to a jury of the driver’s level of impairment. However, breathalyzers can be inaccurate and have been challenged by Criminal Defense Attorneys throughout the State of Florida, including Palm Beach County. There are several things that could affect the reliability of the test results, including but not limited to: improper machine calibration, irregular temperature outside of the machine, irregular temperature of the test-taker’s body, if the test-taker is diabetic, if the test-taker holds his or her breath, chewing gum, vomiting, regurgitation, burping, acid reflux, use of mouth wash, inhalers, alcohol held in a persons mouth by dentures, or even cold sores. A Palm Beach Criminal Defense attorney can also review data regarding a specific breathalyzer machine from FDLE (Florida Department of Law Enforcement) to examine the history of the machine’s diagnostic reports and look for past problems with the machine and the history of maintenance. FDLE has strict protocol for the testing and maintenance of Florida’s breath testing machines and provides the information to the public. Anyone who is facing DUI charges where breathalyzers are involved in Palm Beach County should consult with a Palm Beach Criminal Defense Attorney to discuss their options. There may be defenses to the charges, methods of challenging the reliability of the breath results, or available diversionary programs.